The Kenny Garrett Group during a 1995 U.S. tour. 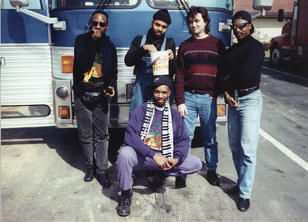 Pictured left to right are Nat Reeves, Rudy Bird, Kenny Garrett (standing), Mark Templeton and Etienne Stadwijk. Not pictured is drummer Ricky Wellman.This group travelled to Europe several times, playing at the Nice Jazz festival and the World Expo "91. North American performances included the Montreal Jazz Festival. 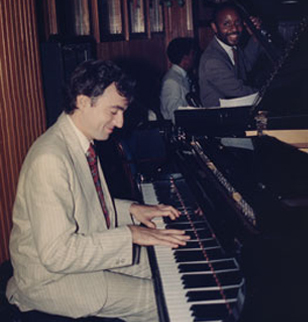 With late bass great Ed Jones, known for his work with the Count Basie Orchestra. This shot was from a Music Mountain Concert 1990. 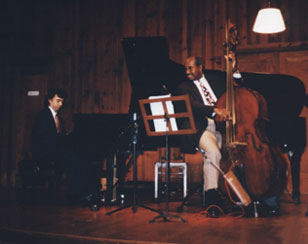 Ed played 3 concerts at Music Mountain with the trio, all of which were recorded to digital 2 track. To hear some cuts of this group go to jazz recordings. Mark is currently working with vocalists Paulette Barnes and Phil LoPresti performing a variety of Big Band and traditional classics popularized by Frank Sinatra, Tony Bennett, Jimmy Roselli Andrea Bocelli and Bobby Darin.